OXID eXchange | Developer's Guide 0.9.20 | Stable | EE, PE | 4.8.x/5.1.x - 4.9.x/5.2.x | Module, Themes, Language Packs direkt herunterladen! Supports developers in creating modules and themes. 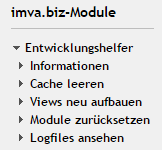 imva.biz Developer’s Guide (also named Entwicklungshelfer, "development aid worker") supports developers in their work on the shop by providing one-click quick access to often executed actions. Very useful for module and template development! This module extends the shop admin with a new menu and does not affect the regular shop operation.We recommend you to keep dialogues enabled when using the module in a productive environment or even better, not to enable this module. imva.biz implements online shops based on OXID eShop. Installation service, module development, templating, consulting and dedicated web hosting shape a basis for a full-service supply.